F&W Senior Wine Editor Ray Isle tasted 105 Washington state reds and discovered that choosing 20 top wines was one of the most difficult selections he’s ever had to make. Across the board, quality was remarkably high—a testimony to how exciting Washington state wines are right now. Winemaker Mike Januik was known as Mr. Merlot when he worked for the Washington megaproducer Chateau Ste. Michelle. His nickname is still apt: Witness this irresistibly plush, mocha-inflected red. Blueberry and aromatic oak notes define this graceful, firm red. It’s from a winery that— in the scrappy, D.I.Y. fashion of many Walla Walla Valley producers—operates out of two remodeled potato sheds. 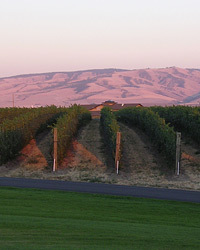 Pepper Bridge, founded in 1991, has been a key player in developing the reputation of Washington’s Walla Walla Valley region, and rightly so: Anyone with doubts about Merlot should taste this seductive, velvety, chocolate-and-black-cherry red. In 1972, when Kiona was founded, there were no roads or utilities on Red Mountain—and not many vines either. Now it’s one of Washington’s most acclaimed regions for Bordeaux-variety reds, with wines like this fresh, bright, berry-driven Cabernet. The 2005 vintage’s cloudless summer, cool autumn and mild Indian summer produced many extraordinarily good reds in Washington, including this intense Walla Walla Cabernet, which is abundantly full of ripe black- and red-currant fruit. By far the largest winery in Washington, Chateau Ste. Michelle makes a dizzying range of wines at consistently high levels of quality. Its Cold Creek Vineyard produces robust, dark Cabernets like this one; its 2004 Artist Series Meritage ($48) is an elegant red full of coffee and cassis notes. Named after the 19th-century frontier fort, this boutique winery makes a range of good reds, among them this black cherry–rich Cabernet, notable for its silky texture. Owner Mark Newton started out making sparkling wine, then shifted to table wines in 1990. By adding a small percentage of Viognier during fermentation, he gives his peppery Syrah a light, aromatic hint of white peach. Master Sommelier Greg Harrington left a restaurant career in New York City for Walla Walla a couple of years back. His plan? To make top notch Rhône-style wines, like this gamey, elegantly focused Syrah. Eric Dunham, a Walla Walla native, sources grapes from the Lewis Estate vineyard, at the base of Rattlesnake Ridge, to make this powerful, black-fruited Syrah. Doug McCrea founded his eponymous winery in 1988 to concentrate solely on Rhône-varietal wines. Among the many superb reds he produces is this rich, savory Syrah, one of the best in the state. The late Dr. Walter Clore, “the father of Washington wine,” helped the Monson family plant this large Columbia Valley vineyard. It produces appealing wines like this curranty Cabernet blend. Founded in 1984, Waterbrook Winery produces a broad range of wines. One of the best (and one of the best deals) is Mélange, a Merlot-based red whose flavor suggests wild raspberry jam. Cadence’s powerful red from the 25-acre Tapteil Vineyard on Red Mountain— 50 percent Cabernet Sauvignon blended with smaller amounts of Merlot and Cabernet Franc—could convince even the mayor of Napa to promote Washington wines. Its earthy, black cherry flavors and ripe tannins last and last. Winemaker-owner Chris Camarda is indisputably one of the superstars of Washington state red wine. This complex, mouthfilling Bordeaux-style blend, full of succulent blue- and blackberry fruit, comes from the acclaimed Champoux Vineyard, located in the Horse Heaven Hills AVA.